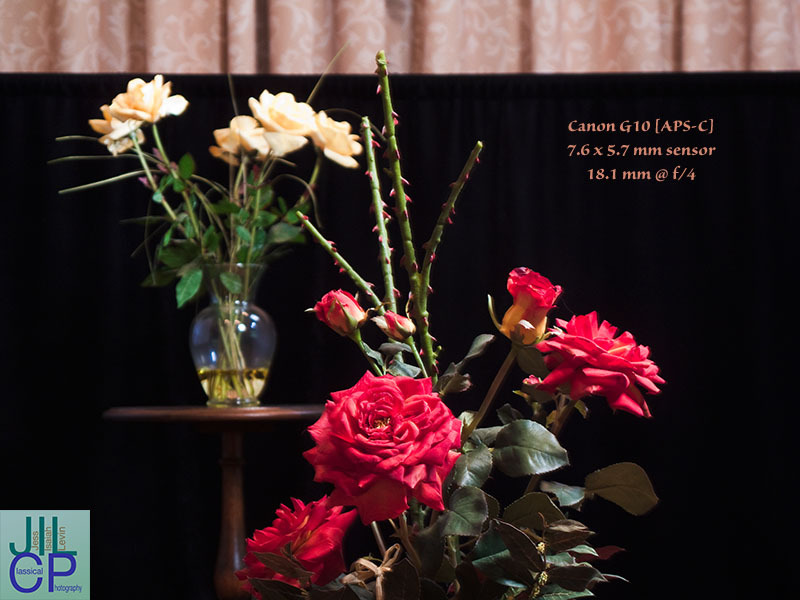 A demonstration of the effect of format (sensor area) on depth of field. If you have read (or participated in) any discussions of how depth of field varies between different camera formats, you know that disagreements tend to arise. Virtually all of the arguments boil down to different interpretations of terminology. In other words, the basic principles of optics in this area are well established, but comparing a small camera to a large camera requires some decisions about what factors we want to remain constant before we can measure just how any other factors may vary. Instead of writing another essay on the mathematics of depth of field, I thought it might be fun and instructive to set up a practical demonstration. From my point of view as a photographer, a comparison of the look of different cameras and/or lenses means setting things up so that all images are shot from the same perspective, i.e. as nearly as possible the same spot. If I want to isolate the effect of varying depth of field - as opposed to, let's say, the obvious fact that a wide angle lens shows things across a wide area while a telephoto narrows our view and excludes some things - then what I want to do is arrange to have each camera show the same view. I want to essentially make "the same picture" using each, and see what differences remain. To that end, I set up a little still life under controlled conditions. I used artificial flowers, a black velvet backdrop, and drapes with a soft but distinct pattern. Three cameras were used, each mounted in turn on a tripod which remained fixed in place. The foreground red flower (which was the focal point for each shot) was about 5 feet (1.5 meters) from the camera. The yellow flowers were an additional 5 or 6 feet distant. The black velvet was there to set off the objects in front of it and make their blur qualities apparent. The patterned drape was about 16 feet (5 meters) from the camera. 4. Our judgment and perception of what is sufficiently sharply focused at the viewing distance for our acuity of vision. Other factors that are often discussed, such as lens focal length and subject distance, are pretty well subsumed under the category of magnification. You can find many discussions and explanations of everything involved, and my simplification may be too great, but let's move on to the demonstration photos. All of the photos have been sized equally, at 800x600 pixels. This is of course much smaller in terms of detail and information than what you could see in any reasonably sized prints. Still, I feel that these web images are sufficient to show some of the differences that result from increasing sensor size. To be precise, we're looking at the degree of blurring of the very-out-of-focus areas, rather than trying to measure the exact range that is in sharp focus. The two properties track each other to a reasonable degree, at least in the realm of camera sizes and subject distances that we're dealing with in this demonstration. The first image was shot with a Canon G10, which has a rather typical sensor size for a small "digicam", measuring about 7.6 x 5.7 millimeters. It comes equipped with a zoom lens, and to match the view to what I was about to shoot with the larger cameras, I used a focal length of 18.1 mm. 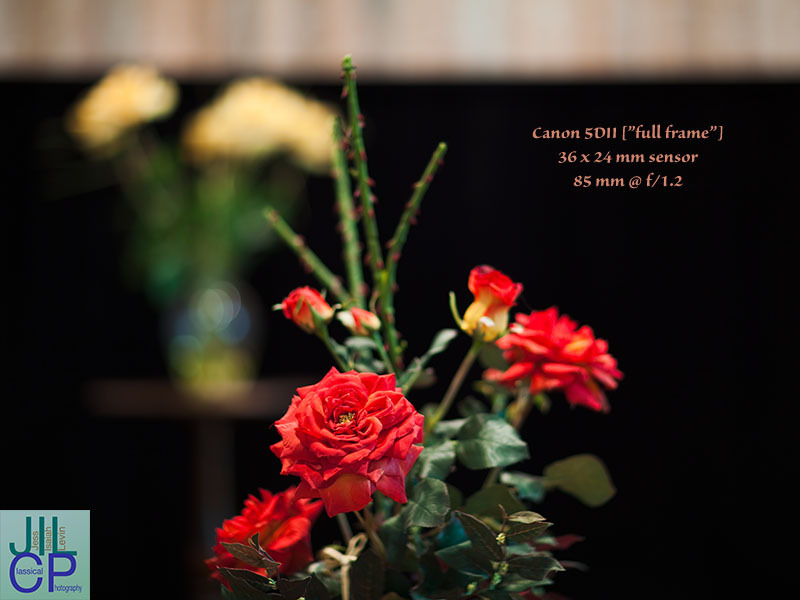 Note that this is not a "35mm equivalent", this is the actual focal length. As in each of the first three images, I used a lens aperture of f/4. Also as in each shot, I focused on the nearest red flower. Notice that the stems at the back of the array are pretty close to focus, the yellow flowers are soft but their leaves and vase are fairly distinct, and the curtains in back, although definitely blurry, show their floral pattern. 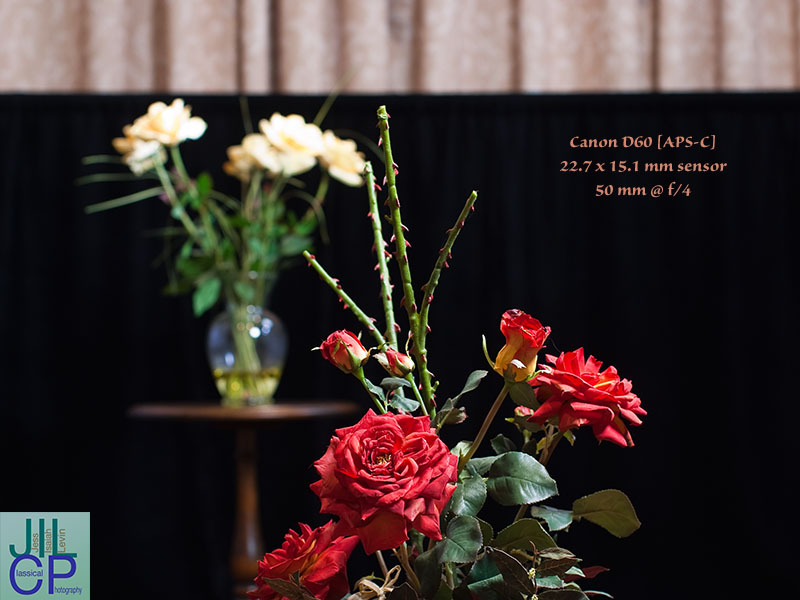 Next I used my "old" (2002) Canon D60, a digital SLR which has a sensor classed as "APS-C", measuring about 22.7 x 15.1 mm. A 50 mm lens gave virtually the same view as the G10 shot, once I cropped a little of the sides of the image to bring the 2:3 aspect ratio to a match with the 3:4 aspect of the G10. You will notice differences in color rendition, contrast, etc., but I am looking at the different range of sharp focus and character of blurred areas. Remember that the aperture is once again f/4. If you notice the foreground flowers looking a little lower against the background, that is because the greater size of the camera body (which has a battery grip on the bottom) put the lens a good deal higher on the tripod, which was not adjusted. In this shot, the yellow flowers are softer, the table shows substantial blur, and the pattern on the curtains is harder to discern. 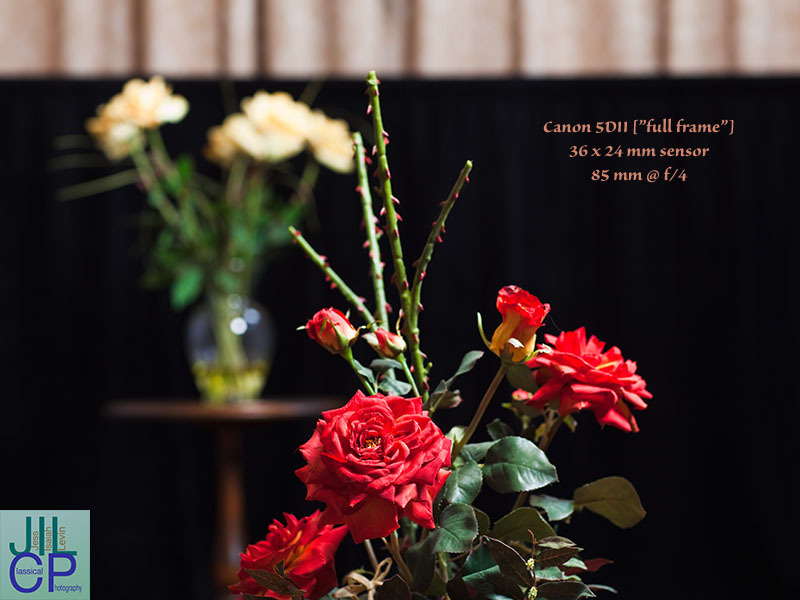 The final step in my series of increasing sensor size was a Canon 5DMkII, which has a "full frame" sensor, i.e. one the size of 35mm film frames, 36 x 24 mm. An 85 mm lens gave almost the same view, and again we were at f/4. You can see that the vase and table are becoming more like an impression than a drawing (though some reflections in the glass are harsher than I would like) and the drapery has lost almost all pattern except the vertical lines of the folds. Coming from a background of shooting film in formats ranging from 24 x 36 mm to 56 x 84 mm, I knew that format makes a difference to depth of field. The tiny sensors in pocketable digicams take these differences to new levels. You can get huge depth of field to cover a near to far landscape without stopping down the lens very far or resorting to lens tilts as used by large format photographers. The trade off is that it is almost impossible to get the kind of very shallow depth of field that can isolate a subject. When that is appropriate, and particularly if you have a wide aperture lens available and can focus it with the extreme accuracy required, you have in a larger camera a tool that can give the look you want. If you have the patience and skill to shoot 8x10 film in a view camera, you may be startled at how narrow your depth of field can be at head-and-shoulders portrait distances with the lens set at f/8! Personally, I'll stick with 24x36 mm digital and fast lenses for portraits for now.